Maze Rattan Winchester 2 Seat Sofa Set: This 4 person sofa set consists of a 2 seat sofa, 2 armchairs and a glass top coffee table. The set comes complete with comfortable seat and back cushions in cream which match the natural tones of the rounded rattan weave perfectly. 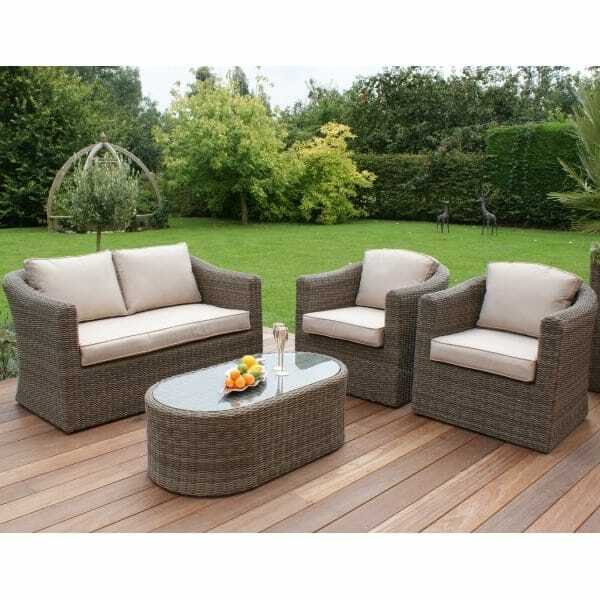 This classic sofa set would look fantastic whether out on the patio or in the conservatory and is the perfect furniture set to sit on to relax away the evening with your choice of refreshments within arm’s reach on the glass top coffee table. The coffee table glass is tempered for safety and is very easy to clean and maintain. This rattan garden furniture from the Winchester range can be left out year round as it is weatherproof and the frame is made from rust resistant aluminium, for your peace of mind this set has a 5 year manufacturer’s warranty.